CGA-346 & CGA-347 Pressure Plug - August Industries Inc.
A CGA 346 and 347 Pressure sealing end plug. 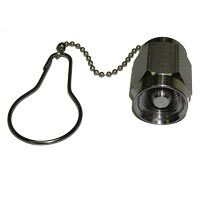 Stainless steel and designed to seal both CGA 346 and 347 male threads. Rated for 5,000 PSI service. Includes clip and chain.